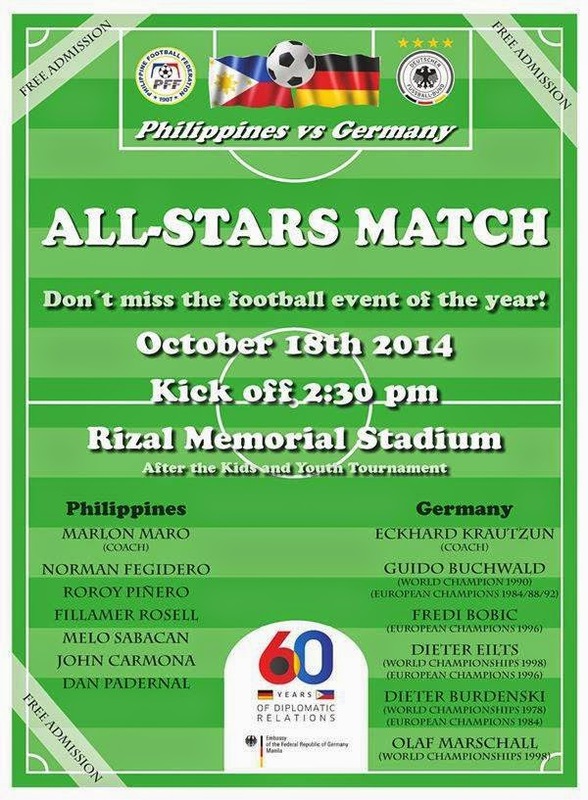 In celebration of the 60 Years of Diplomatic Relations between Germany and the Philippines, witness the football greats of the two countries as they battle it out in an All-Stars Match at the Rizal Memorial Stadium in Manila on October 18, 2014 (Saturday) at 2:30 pm. This football game is just one of their series of events. The game will feature German football legends: Guido Buchwald (former German national team player and 1990 World Champion), and 1996 European Champions Fredi Bobic and Dieter Eilts, Dieter Burdenski, and Olaf Marschall. The Germans will play against Philippine football veterans Norman Fegidero (who scored the goal that beat the Harimau Malaya in the 1991 SEA Games), Roroy Piñero, Fillamer Rosell, Melo Sabacan, John Carmona, and Dan Padernal. Admission to the football All-Stars game is FREE!